Dave Wilcox, Karen Moore and I are leading a trip to Ireland this July - you can find out more information here - and we'd love you to consider joining us. Watching The Life and Death of Colonel Blimp the other day had me considering one of its tricks, when the central character emerges from a swimming pool younger than when he went in. That feels like a good metaphor for what I think will happen to those of us who spend ten days in northern Ireland this summer, walking the landscape, building community, re-imagining. So here's my thoughts on Colonel Blimp, written originally for Reel Spirituality and I hope you'll think about coming with me to Belfast in July. How can I convince you to watch The Life and Death of Colonel Blimp? The question itself is problematic, for a film so dedicated to a desire for an end to war, the violence inherent in the attempt at convincing someone else of its value is paradoxical. The understanding of non-violent communication advanced, for instance, in Marshall Rosenberg's work raises profound implications for film critics (and critics of any medium). Non-violent communication invites us into a revolution in how we talk with each other: speaking not what we think the other needs to hear, nor what we might want them to believe, but what we would like the other to understand, and letting go of whether or not they do. And the purpose of listening is to understand the other, not to be persuaded, or to persuade. So if unthinking persuasion is a form of violence, then it’s paradoxical to ask how I can persuade you to watch The Life and Death of Colonel Blimp, a film, among other things, about the hope for an end to violence. It’s a challenge faced by characters in the film I was most reminded of while watching the exquisite BluRay of Blimp, Sergio Leone’s Once Upon a Time in America, also newly restored (though prematurely released, for the restoration work is incomplete, and copyright reasons mean it can only be bought on BluRay in Italy. But I still couldn’t resist buying it, so if you come to my house we can watch it together). Blimp is about a British army officer living through three wars, failing to speak up for the woman he loves, and feeling out of time with his culture, while the most consistent relationship in his life is a great friendship with a German opposite number. America is about a kid growing up into a gangster living through family torment, failing to understand - and ultimately horrifically abusing - the woman he loves, feeling out of time with his culture, while the most consistent relationship in his life is a flawed friendship with an unstable comrade. Roger Livesey’s Colonel and Robert de Niro’s operating partner gangster have much in common - they fight for a living, they lose the woman they love, they wonder what’s in it for them. Both films are staggering in scope - each a canvas of over 40 years in the life of one man. Both are about suffering and loss and what we do with it. Their protagonists make different choices - the Colonel endures with no sense of victimhood: he merely serves and feels sad, yet at his twilight he is loved and friended and proud; Noodles, however, struggles to grow out of childish, selfish impulses, can’t handle the responsibility of loving someone well (or letting them go), and his ultimate tragedy is to try to control every outcome. It blows up in his face, and the film’s flashback structure may belie one of the most disturbing first person narrative postures in cinema: our ‘hero’ may actually be dreaming most of the film, in which he gets the moral upper hand, while he’s actually hallucinating in an opium den, awaiting his own murder. It’s in their reflection on what it takes to make a life, and their resonance with the achings and longings we all share - for love, for forgiveness, for security, for fame, for joy, for family, for the feeling of being part of a bigger picture, that Blimp and America become religious iconography, lenses through which we imagine God. The Colonel is wise enough as a young man to know that one day he will be old; he has that ineffable sense of knowing that there are things he does not know. Noodles - sent to prison as a teenager for avenging his young friend’s murder - was mixed up to begin with, then stunted in confusing childishness with childlikeness. He doesn’t know what he doesn’t know, and so he thinks he can do anything; without mentors or initiation, he is left grasping for how to be in the world - confusing a desire to possess with love, unable to ask for things instead of demanding them or worse. The jazz of these films is exhilarating - the sequence in which the Colonel’s post-heartbreak life is portrayed as a decade or so of hunting exotic animals, so that wall-mounted dead heads is all he has to show for it; the first meeting of Noodles and his best friend/nemesis Max, when a pocket watch is switched between three guys, each of them telling the time at which they took it; the set-up for the duel in Blimp (which Scorsese homages in Raging Bull), that leads to deep friendship between two men whose countries are at war - a more courageous statement than most current storytellers have been willing to make in the context of our contemporary conflicts; the use of a muzaky version of Yesterday to evoke not only Noodles’ regret but the shallowness of the world he’s entering (or fantasizing); and most of all the last two minutes of The Life and Death of Colonel Blimp, which deserve to be seen without spoilers. Blimp’s co-director, Michael Powell, wanted to be eulogized as ‘film director and optimist’; the last line of this epic comedy of the human condition, manages to be both perhaps the saddest and most life-affirming one might imagine. One of these films is thirty years old, the other seventy. One day everyone reading this will be older than both combined, should we find ourselves into eternity, or if Ray Kurzweil’s singularity proves to have sufficient tenacity. Whatever our age, we will form an identity partly from the leavings of our memories: how we interpret the story we’re telling ourselves about what has happened to us and what we have done yesterday will determine the shape of the story we choose to live in today. If everything is autobiography, if storytelling is a way of life, then we actually do live in a magical, fairy tale world where we can construct our own meaning. Isn’t that what we all do? With reference to personal experience, sacred texts or wisdom, community traditions, and the exercise of discernment, we figure out a story that works (or doesn’t work until we find one that does). The Life and Death of Colonel Blimp and Once Upon a Time in America are two sides of a coin - they could be about the same man making different choices. 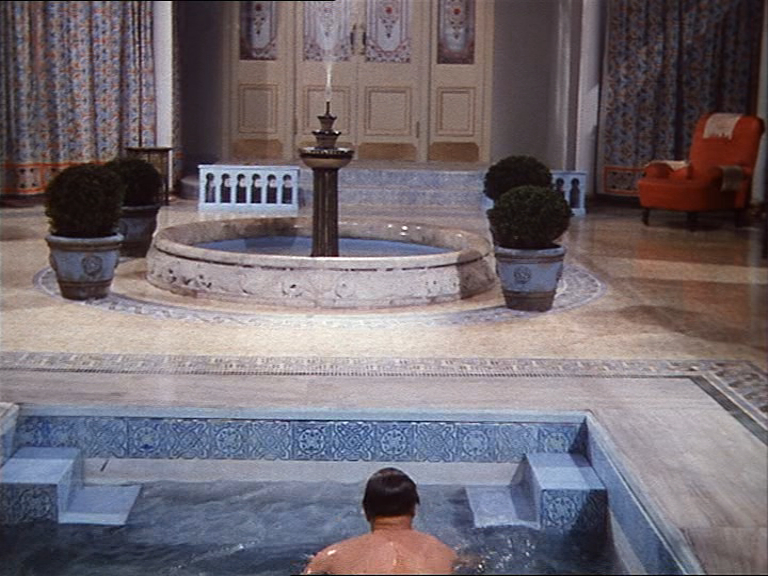 Both begin with the protagonist traveling through a door in time - the Colonel swimming in a Turkish bath, Noodles walking through a gate in a train station. The Colonel emerges from the pool younger - it’s 40 years ago and the story can start with limitless possibility; Noodles comes back through the door 35 years later, and his story is ending, filled with regret. Emerging from the pool younger. I’d like that. I’d like to respond to a film’s evocation of a full life by choosing to reset my own path in the places where it lacks responsibility, or service, or rest, or community, or kindness. I’d like to respond to a movie that honors ‘protocol’ by learning to take life seriously, but to not take myself too seriously. I’d like to respect the calling of a film like The Life and Death of Colonel Blimp, whose directors made some massive out of very little, who gave themselves over to the imagination and created something that will last. I’d like to avoid living like the characters in Once Upon a Time in America. But I shouldn’t deny the resonance with Noodles’ brokenness - if you can empathize with (and learn something from) a fake colonel in Second World War London, why not with a fake gangster in Prohibition New York? If Colonel Blimp can emerge from the pool younger, can’t I do the same? Come to Ireland with us in July and let's talk. Sound good, ok?